While some see ChiLo as a beacon of freedom in an increasingly crowded world, that freedom comes with a price. From the mob families that run the city to corrupt councilmen and women, it’s hard to get out from under the thumb of organized crime in the Midwest. Of course, these factions don’t necessarily get along. In the name of profit, anyone can become your enemy, and when criminals and corporations clash, someone is coming out rich. 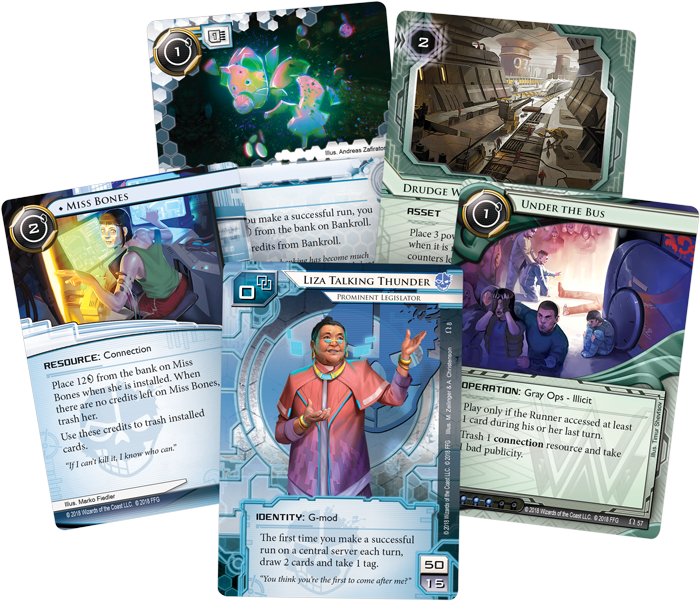 Join us today as we preview the Criminal and Weyland cards found in Reign and Reverie, the final deluxe expansion for Android: Netrunner The Card Game. 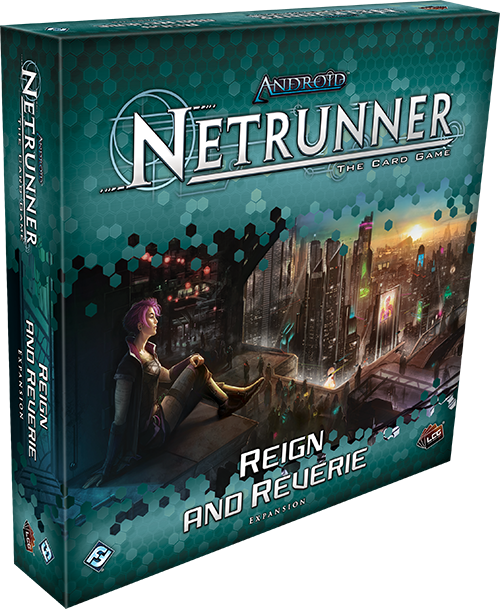 Reign and Reverie contains cards for every faction in Android: Netrunner, expanding their options with new identities, consoles, agendas, and more. Crime is everywhere in ChiLo. Liza Talking Thunder (Reign and Reverie, 8) is a prominent legislator, but she still engages in backroom deals, bribery, and more to maintain her position of authority. Being a criminal when you’re a figure of some authority can provide quite the challenge—all eyes are on you after all—but this fame can also provide resources. The first time Liza Talking Thunder make a successful run on a central server each turn, you draw two cards and take one tag. While taking a tag can be a dangerous proposition, drawing more of your cards is a powerful tradeoff. You can quickly curate your hand to include the tools you need without wasting precious clicks. And with this many options, who cares if you’re being watched via a tag or two: you’re untouchable. 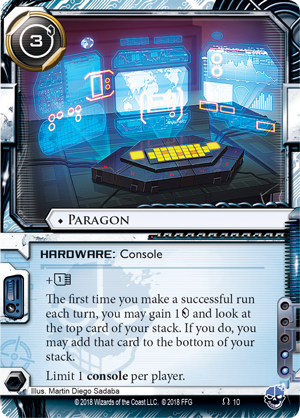 There is even less concern if you have new Criminal console Paragon (Reign and Reverie, 10) on the field. Designed to synergize with Talking Thunder, Paragon lets you view the top card of your stack, choose whether or not to put it on the bottom, and gain one credit. When used with Liza after a run on a central server, this lets you filter the cards you draw with her ability, making it even more likely you will find exactly what you need when you make your first run of the turn. If you really want to push your luck, Hot Pursuit (Reign and Reverie, 9) can add credits to your run in exchange for drawing a bit more attention. This two-cost event starts a run on HQ, which, if successful, allows you to gain nine credits and a tag. 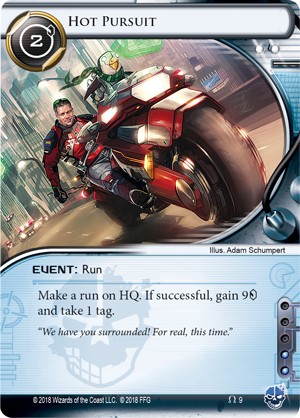 While this can be a powerful swing in resources on its own, the ability stacks with Liza Talking Thunder, and if Hot Pursuit is your first run of the turn, a successful run sees you gain two cards, nine credits, two tags, and a card access from HQ—a package that makes the tags more than worth it. Liza Talking Thunder is many things. A legislator, a mother, and a role model, but beneath it all, at her heart, she is a runner looking to make a profit. Even if all eyes are on her, she has the resources necessary to bring down those that oppose her and make a profit along the way. 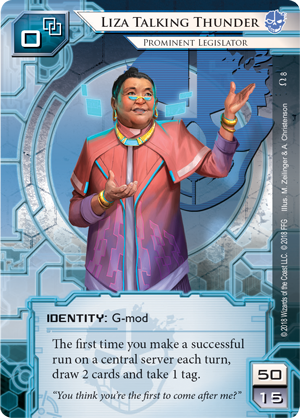 We’ve already revealed the terrifying The Outfit (Reign and Reverie, 50) of mob bosses that runs the streets of ChiLo. Weyland has always been known for their shady business practices, but The Outfit is on another level. They rule through fear, taking public vengeance on those who stand against them, ensuring any runner will think twice before uncovering their plans. Broad Daylight (Reign and Reverie, 51) feeds into this mentality. When you score this agenda, you may choose to take one bad publicity, then place one agenda counter on Broad Daylight for each bad publicity you have. Then, once per turn, you can spend a click and a hosted agenda counter to deal two meat damage. This looming threat makes Broad Daylight constantly dangerous and ensures that they will have to spend a significant amount of time keeping their hand stocked, lest they suffer an unfortunate Traffic Accident (Order and Chaos, 22) in Broad Daylight. 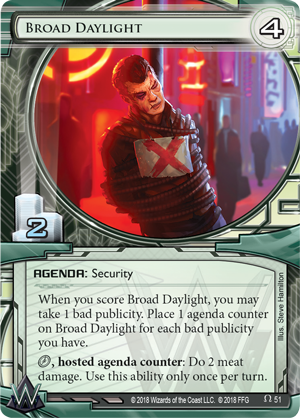 Weyland just doesn’t go after you, they’ll go after your friends, your family, and even the connections you’ve made that assist you in your runs. When you stand against Weyland, no one is safe. 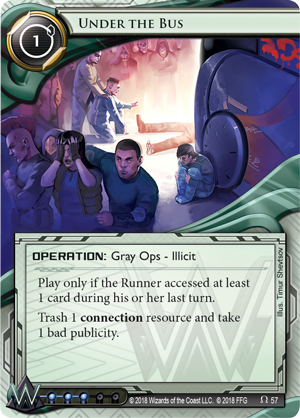 Under the Bus (Reign and Reverie, 57) is a gray ops operation that can only be played if the runner accessed a card during his or her last turn, and it allows you to freely trash one connection resource and take one bad publicity. 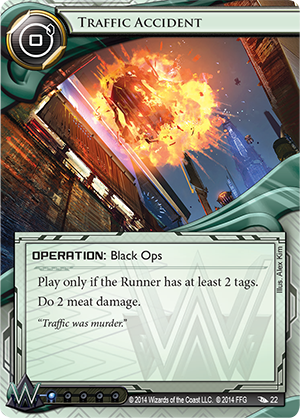 If the runner even thinks about digging up your secrets, Weyland responds quickly and brutally. Of course, if The Outfit is behind it, they also make a profit off of their evil deeds, as they continuously tighten their grip around ChiLo. While those at the top of The Outfit revel in their riches, their empire is built on Drudge Work (Reign and Reverie, 52). As an asset, you can use Drudge Work to build your empire too. 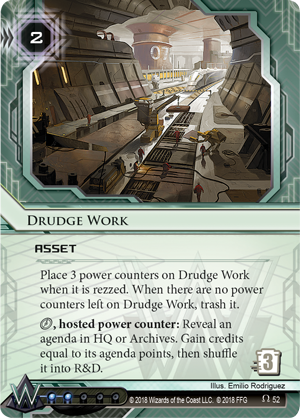 You may place three power counters on Drudge Work when it is rezzed and for a click and a hosted power counter, you may reveal an agenda in HQ or Archives, gain credits equal to its agenda points, and shuffle it into R&D. Getting rid of agendas from your hand or archives is a powerful ability, and Drudge Work allows you to make a profit while doing it. It isn’t glorious, but it's important work. Crime pays well in ChiLo. It can elevate you to a position of power, and fear can be used to keep you there. But even so, those in power don’t always get along. 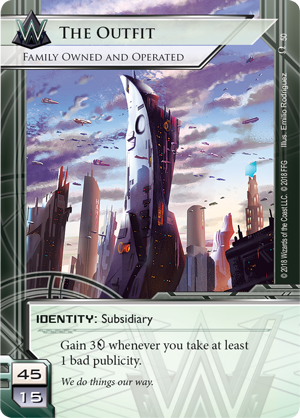 Will you use your newfound resources to bring down the corporations around you, or will you keep the populace in a state of fear? Make your choice with Reign and Reverie (ADN56), available now for pre-order from your local retailer or our website.